The legendary watchmaker Citizen was founded in 1924. Since that time, they have carved out a reputation for themselves as one of the most respected makers of fine watches. In fact, since 1986, they have been the largest watchmaking company in the world. Citizen is also known for being a leader in the advanced technology of watches, developing the first watch with voice recognition and the world’s slimmest LCD watch. Citizen may not attract the cult-like following as Casio G-Shock does when it comes to tough watches. But for those looking for tough watch alternatives other than G-Shock, a number of Citizen’s flagship collection is worth serious consideration. The one model that we’re going to be talking about today is the Citizen men’s JY0010-50E Eco-Drive Skyhawk A-T titanium watch. Let’s get down right to it and see what makes it a fine tough watch. The Citizen men’s JY0010-50E Eco-Drive Skyhawk A-T titanium watch redefines atomic timekeeping with Eco-Drive technology and radio-controlled accuracy. Radio signals can be received both on-demand and automatically in Japan, China, Europe, the United Kingdom and North America. This Citizen JY0010-50E review will take a look at the various features that this watch has to offer, pointing out which of these features are the best and worst. This will hopefully give you the information that you need in order to make an informed decision before you purchase a watch. World Time. This gives you the ability to select the cities where you are interested in keeping track of the time. Therefore, you will not need to constantly scroll through every city to find the ones that you want. In total, there are 43 cities that you can choose from. Clasp. The double-button clasp is secure and does not come undone when it gets hit by something. However, it is easy to remove when you want to. If you get hot and need to let the watch out a little bit, you can make a micro-adustment with a tooth pick. 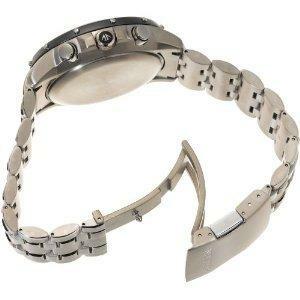 This might seem minor but if you are serious about getting tough on your watches, the clasp design is one aspect that you’d want to be paying attention to. Comfort. In terms of comfort, this watch is smooth and light. Sometimes you even forget you are wearing it. Looks. Orange blacklight, polished/brushed bracelet, bezel and the orange accents on the dial make this a very attractive watch, and one that you can be proud to wear for any occasion. Radio control reception. It is very difficult to sync the watch from a room. The person using the watch will often find it necessary to go to an outdoor location where no buildings are able to block the signal. As frustrating as it might be, but this is not the only problem you will encounter with this feature. After you have gone out of your way to find a clear location, you will then need to wait roughly 10 minutes for the watch to get into sync. Quirky functionality: Because the backlight button is the same as the start/stop button, it is not possible to use this watch in the dark. Your local information can not be seen at the same time as the date and time of your second time zone. In order to utilize most of the functions that are offered by this watch, the user is required to pull out the crown. Mineral crystal. It is almost impossible to wear this watch on a regular basis and not scratch the mineral crystal. It would have been wise for Citizen to use scratch-proof sapphire crystals instead. 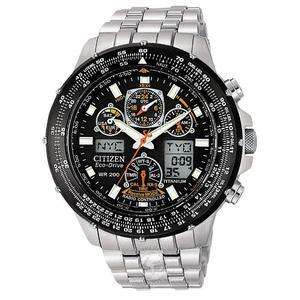 There are tonnes of Citizen watch reviews but only a fraction discuss about the JY0010-50E. Given the price tag that comes with the watch, this is to be expected. The number of owners of such expensive watch as this is definitely outnumbered by other watch models in the lower price category. I don’t officially have the number for the satisfaction level. But based on what I’ve been reading and hearing, many owners praise the JY0010-50E as a brilliantly engineered time piece. It is one of the rare few watches that offer excellent combination of atomic/solar technology and high-quality physical attributes. It might not have hit perfect scores on all the attributes. But if you are looking for a tough yet elegant watch, there are not many alternatives that comes close to matching the Citizen JY0010-50E Eco-Drive Skyhawk A-T titanium watch. Are you made up about getting a Citizen watch? If not, why not take a look at our pick for the best tough watches in the $500 price range. How G-Shock Frogman Watches are Built for Maximum Toughness Citizen Eco-Drive Nighthawk BJ7000-52E: A Choice for Classy and Tough Watch What does Citizen BJ8050-08E have to Offer? Citizen BN0000-04H: An Elegant Men’s Dive Watch? It (like most radio sync) watches, syncs much better at night. I’m on the east coast, I leave it near a window and it syncs most nights, more than enough to keep the time within a second.